If you've been looking into getting an antique style popcorn machine, but you can't decide which to get, you might find this article useful. We will compare below two of the most popular and best rated popcorn machines bought by Amazon customers. Both machines are designed in the style of the antique popcorn carts of the 1890s, so now you can enjoy your favorite snack in turn of the century fashion! These machines come with an attached cart, but when floor space is at a minimum, the cart easily detaches, and the unit can be placed on a table or on the kitchen countertop. They are also usually equipped with 6 to 8 ounce kettles, a warming light, a storage compartment and an attached shelf for preparing the kernels. 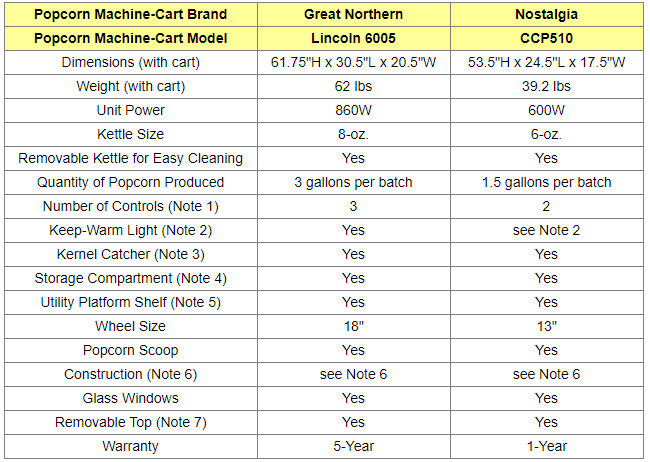 This article will compare Great Northern Lincoln 6005 and Nostalgia CCP510 popcorn machines (with cart). These were not just the most popular among Amazon customers at the time this article was written, but they had also received excellent reviews from most Amazon buyers (an average of 4.5 stars each out of 5 stars!). Selected Popcorn Machines on Amazon. The Great Northern unit is equipped with 3 control switches, one for turning on/off the the kettle heater, the other for switching on/off the spotlight warmer, and the third one for activating and stopping the stirrer. The Nostalgia unit is equipped with 2 control switches, one for turning on/off the unit and the other for switching on/off the interior light. The warming light the Great Northern unit is equipped with keeps the popcorn crispy and warm for hours. The Nostalgia unit also has an interior light. 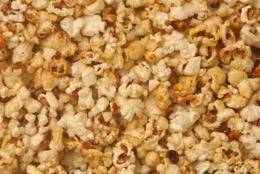 ​It's there more for cosmetics as it lets you and your guests watch the kernels pop to perfection. Though it is not specifically meant to keep the popcorn warm, being a light, it will still keep the popcorns warm to a certain degree. Both popcorn makers are equipped with a convenient storage cabinet to store all of your popcorn supplies. It is perfect place to keep your popcorn bags and other supplies. Both popcorn makers are equipped with a kernel catching tray that collects the un-popped kernels. Both popcorn makers have carts that are equipped with a utility shelf that can be used for popcorn preparation. The Great Northern unit is made of heavy-duty powder coated steel and stainless steel. ​The Nostalgia unit is also made of steel and stainless steel. Both popcorn makers can also be used as a tabletop models without using the cart. Great Northern makes it also possible to buy just the top part without having to buy the cart (see Amazon section below). - For exact price information on these two popcorn machines please refer to the Amazon section below. So which of the two vintage popcorn machines to get? 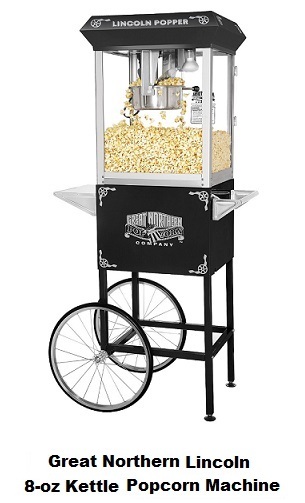 The two popcorn machine-carts considered here are excellent products as shown by the mostly favorable reviews each had received from Amazon customers at the time this article was written. Therefore, there is a good chance that you would be quite happy with any of these four products. 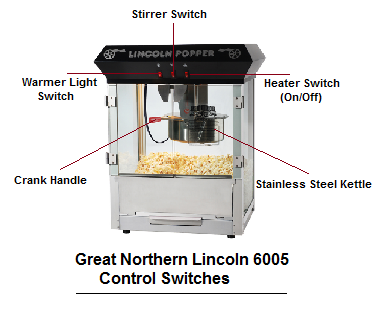 Being larger and more powerful, Great Northern Lincoln can make more popcorn per batch than the Nostalgia CCP510. Indeed, it has a larger kettle (8oz vs. 6oz) and can generate more power. Therefore, it can make twice as much popcorn per batch. Great Northern Lincoln is equipped with a warmer lamp that will keep your popcorn warm and crispy for a long time. The lamp Nostalgia CCP510 is equipped with is there mainly for lighting purposes. Nostalgia CCP510 is completely automatic. You just turn on the machine, and it will pop the kernels until you stop it. You can also turn on the unit's light, if you want to see the kernels popping. On the other hand, Great Northern Lincoln has separate control switches for the heater, the stirrer and the warming lamp. So you need to make sure you activate all three as needed and then not to forget to turn them off. The advantage of having separate control switches is that you can experiment with each switch for different lengths of time and come up with the right technique that will produce the exact popcorn type you like. Great Northern comes with a 5-year limited warranty, while the Nostalgia warranty is 1-year. Finally, as mentioned above, if you don't need the cart, you can purchase the Great Northern Lincoln without the cart (see Amazon section below). Nostalgia CCP510 is available with cart only, though the cart is removable when not needed and the machine usable as a table-unit. Please click the popcorn machine of your choice below for price information or to purchase.